Epoxy is considered the longest and most durable of all types of swimming pool paint types in the market now. It lives about 10 years before it needs to be re-painted. 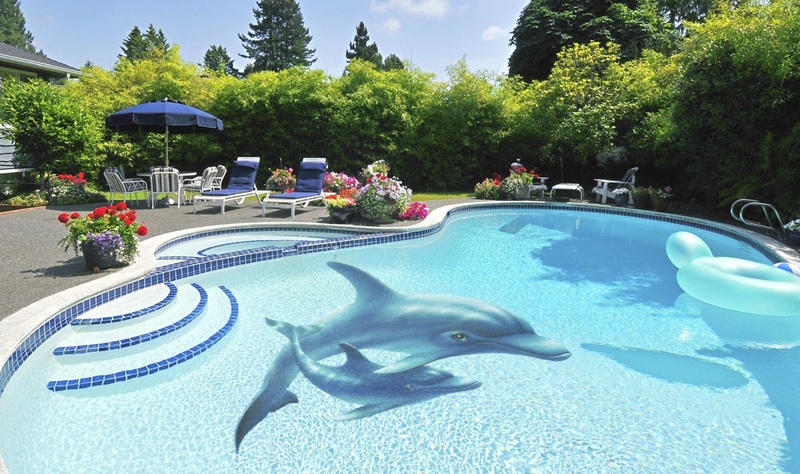 The most important feature about epoxy pool paint is that its resistance to ultraviolet (UV) rays, all mechanized detergents and also to many various cleaning chemicals. 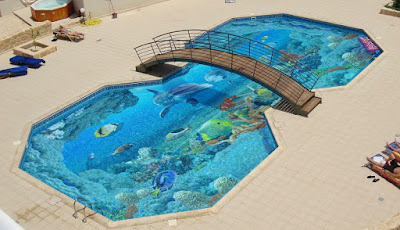 It is another type of special paint for swimming pools in the market, its performance is much less than epoxy, and its age is shorter as well, but what characterizes it is the lower price it has and the ease of installation, also there is now in the market a transformative paints that make this very kinda suitable base for epoxy pool paint. It lives up to 3 years before it needs to be re-painted again. This type suits the paint on any surface whatsoever and can be painted on any other type of coating, such as epoxy pool paint and chlorinated rubber base pool paint and also acrylic itself. It lives up to two years so it is suitable for places that are painted periodically without considering the validity of the current paint. You can see also: How to get 3D Bathroom floors in detail? 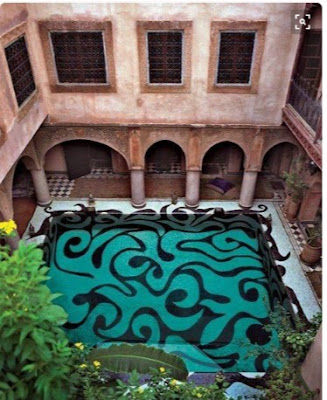 Now we will focus on explaining the first type of epoxy and how it can be used to get a 3D floor at the bottom of the swimming pool of your home or hotel. 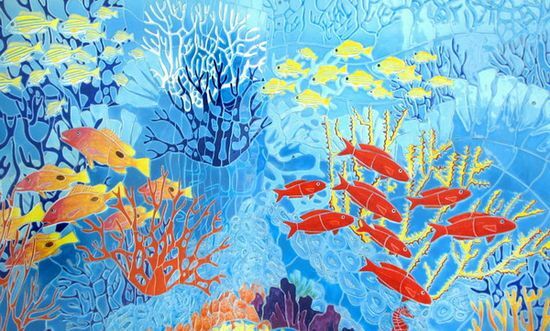 Let me tell you that: if you are thinking of installing it in your home, then the different shapes of dolphins, colorful fish, and coral reefs will give you a sense of relaxation and pleasure for you and your children. This will make bathing in this bathroom a unique experience for all members of the family, which will completely eliminate the monotony resulting from getting used to the pure blue in all swimming pools with all the houses, hotels and clubs of the world. If you do not find your personal pleasure in all this (and I doubt that), then it is enough that your kids will thank you very much for this work that gives them a lot of fun and excitement. But if you're thinking of installing this special 3D floor in the hotel bathroom which is managed or owned by you, then what applied to you and your children at home applies to hotel guests and their little ones too. 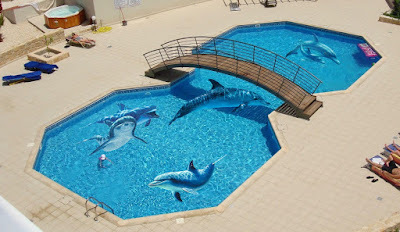 We do not exaggerate when we say that this change you make in the swimming pool of the hotel will be a direct reason in the orientation of many customers to choose your hotel rather than the other hotels, many guests who are activists on the social networking sites, and those who are fond of photography while they are swimming with the dolphins and colored fish or with anything else you choose to put in the 3D floor murals for the swimming pool design will also be present in this painting art and then they publish on their personal accounts, such these things can sponsor your hotel without the need to spend large sums of money on advertising to achieve this. The good thing in the epoxy paint for swimming pools with 3d flooring is that it gives you infinite choices in design which make you able to carry out any design you will choose in your garden or hotel. 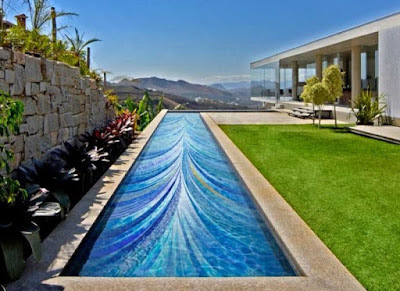 Below we will mention some of these choices with images and also some ideas of designs for swimming pools with 3d flooring. 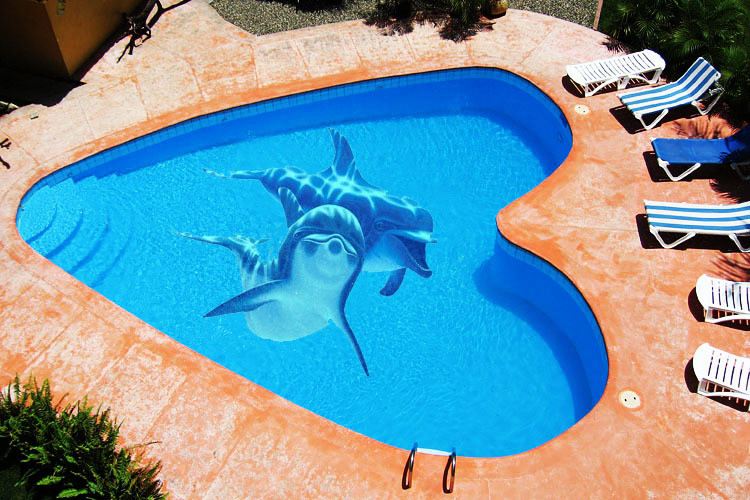 Dolphin is a symbol of joy and fun associated with the sea and swimming pools, using the pictures of real dolphins and cartoons on the floor of your swimming pool will have the magic effect of adding fun to it. The colored fish in the middle of the landscape and the coral reefs on the side of the landscape will give you a sense of diving in the ocean deeps. A lot of risk, effort, and money are being paid for this deep-sea experience. The 3D floors will make your children experience this enjoyable experience without paying a lot of money. 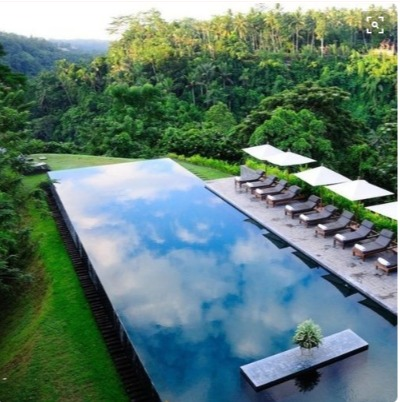 In addition to the attractive scenery that you will enjoy doing in your home garden or your hotel. Many people like the scary designs that represent an adventure to them, their children, and their guests every time they decide to use the bathroom. If you are one of those people, we recommend you a set of designs that contain whales, scary sharks, octopus or other scary, fearsome and predatory sea creatures and marine organisms to choose from. 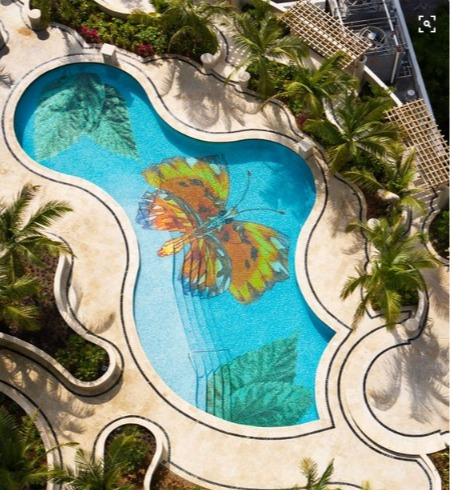 You can also use any 3D fkoor design of beautiful roses or different graphics according to your personal choices that suit the conditions of your hotel or home. 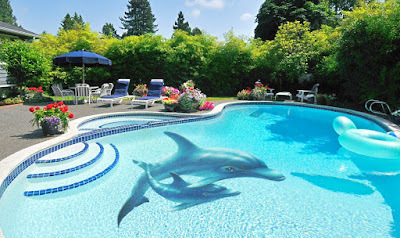 1- Most experts and designers advise home and hotel owners to use the epoxy coating for swimming pool paint. No more foot wounds to you and your children due to tiles, marble or other materials used on bathroom floors. Enjoy the smoothness and balance of your feet after swimming for long hours. Maintenance and cleaning of the bathroom have become easier: you can now put cleaning materials and chemicals without fear or trouble or any occurrence of damage to the floor. 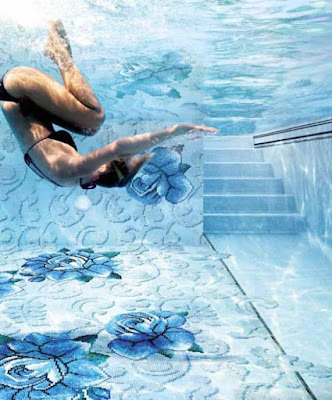 Save your money: All the characteristics of expensive floor types that you pay huge amounts of money for, such as fiber optic, marble and others can be achieved using 3D epoxy floor coating for pools with other advantages such as price difference and design options available. 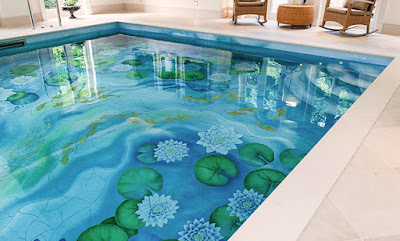 So, How to install 3D Epoxy floor coating for pools? 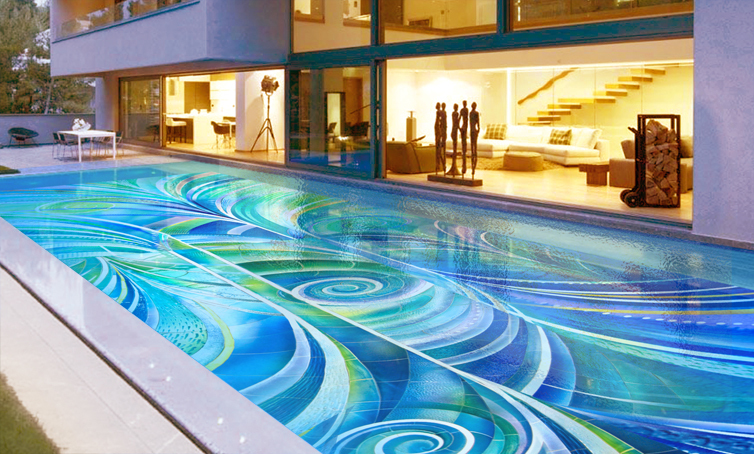 Now that we have talked about some of the options available to you in the design and after choosing one of these designs, here we will explain to you how to install the 3D floor in the pool using epoxy paint step by step. Epoxy Coater Roller Cover, 18-Inch. 24 cm. Wall Rollers Brush defoaming for Epoxy Paint Coatings. One Pair Rigid Spiked Shoes. Cotton rags or paper shop towels. How to apply Epoxy 3D floor coating? First of all, we need to know how to deal with the existing ground we are going to apply Epoxy on it? If it is a new concrete, a paint from another type, or even if it’s an Epoxy paint? How to deal with them in preparing your floor surface for Epoxy application. It’s important and very necessary for the right Epoxy installation that the old concrete base has to be clean and solid as much as possible, there also should not be any stain of grease, oil, detergent or bitumen on the old floor ground. You better clean oil and grease stains from its full depth. The old existing ground has to be free of all debris and flat as much as possible so you can fill all bumps and cracks with cement. Use a detergent and grease remover to thoroughly wash the floor, and then dry it well. 1. The place must be well ventilated before use. 2. Gloves should be worn and gags should be put as a precaution in case of the emergence of certain gases as a result of chemical reactions. 3. Mix the resin with composite steel together by an electric drill, just make sure to mix the two compounds well in the proper temperature and the proportions determined for each of them as shown in the instructions for users stated in the package cans from outside. Tip: There are kinds of epoxy consist of one compound solidifies by the impact of air and the other three types Resin, Hardener, and fillers. Note: Make sure to close the cans after taking the appropriate amounts so as not to spoil them by keeping them in normal temperatures. 4. Pour the processed epoxy into the required areas and distribute evenly on the ground. Use a soft brush roller to cover the ground evenly. Make sure that the appearance and finishing should be as flat and smooth as possible. 5. 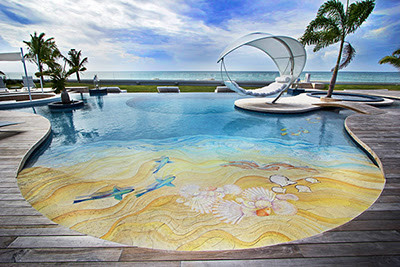 Apply the three-dimensional image you have chosen in order to give an amazing fantasy design to the floor of the pool. 7. Wait 24 hours to allow the work done to dry. 8. Mix a transparent epoxy paint for 5 minutes using an electric drill and then leave it for three minutes to stabilize. 9. Pour the transparent epoxy over the photo and distribute it to every part of the floor evenly to make a layer with a thickness of 4 mm. 10. Use a roller divisive of air to remove air bubbles in order to install the image on the ground properly. 11. In the end, you will get a transparent and beautiful image. 12. After 10 days you will get a solid, robust and scalable platform. we recently shared an article about How to maintain 3D epoxy flooring, Don't miss it! 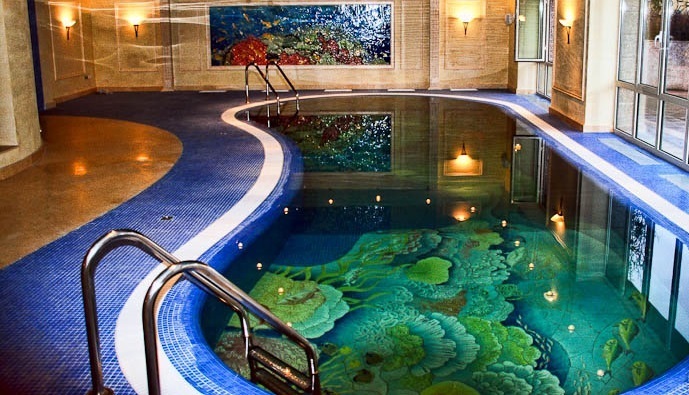 Here we will explain the ways to clean the 3D epoxy floors at the bottom of the swimming pools, and what are the hand tools or any other tools that to be used in the cleaning and the most suitable periodic cleaning schedules. 1- External places should be prevented by chemical exposure, and that is a very important point. 2- Avoid the heavy loads and the direct impact that require a heavier build or thicker floor system. 3- Avoid thermal shocks, it is an important precaution that must be considered. Thermal shocks; such as steam cleaning of the floor surface will cause a loss of bond from thermal expansion if the floor system is not chosen properly. 4- You better specify a floor coating system. 5- For internal places, wet mopping and drying are typically the only upkeep needed to avoid the buildup of dirt particles on and inside internal places. We are looking forward to knowing about your opinion of this new technology to cover floors or post designs you might be implementing or enjoying with in your world. 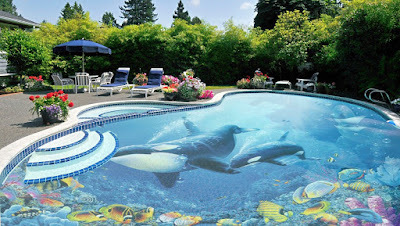 We recommend you the 3D epoxy pool flooring as the trendiest and the best available in the meantime. 1- You will have a 3D flooring design that never fades. 2- Freedom of choice in any landscape or design of the flooring. 3- Environmentally friendly flooring for commercial and industrial buildings. 4- Ease of maintenance, restoration, and change, unlike other products. 5- A strong, solid, non-slip and easy to clean. 6- It has a very long life compared to other types of paints. 7- It will make a comprehensive change to your garden. It’s our pleasure to offer you a great variety of services at the most affordable price range. Today, 3D epoxy flooring price range starts from 100$ up to 550$ per 1 m2. 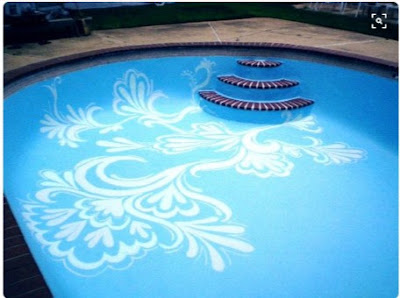 This cost includes materials, chosen pattern (3D image, the cost of paint ...), base preparation, and installation work.